There are many kinds of signatures which can be found on books. Below we’ll discuss them, and how each affects the value of a book. You can click on any of the images for a larger view. Signed means the book has been signed by its author (or perhaps by an illustrator, or editor). Signed books are much desired by collectors, and, generally speaking, a signature will enhance the value of the book. Please note: You might come across the term “flatsigned” while buying books on the internet. This term was coined several years ago by a bookseller on eBay, who uses it to describe a signed book (one that hasn’t been inscribed). It’s not a generally accepted bookselling term, though a few other sellers have adopted it. The word “signed,” as described above, means exactly the same thing and is understood by all collectors & dealers. From a collector’s point of view, there are 2 schools of thought about inscribed books. The first is that inscriptions detract from the desirability of the book; a book inscribed to a stranger is considered inferior to one that bears only the author’s signature or one inscribed to the collector themselves. This is a commonly held view. The second is that inscriptions are great; the more the author wrote in the book, the better. I share this opinion.The book spent more time in the author’s hands, and there is certainly some story behind the signature. A simple signature is generic, and nothing exists to connect it to a particular day in the author’s life or to an encounter with a particular person. Additionally, if the inscription can be shown to be to someone associated with the author (family, friend, editor, or another author, perhaps), its desirability increases. This is called an association copy. There’s always the possibility that, with some research, what first appears to be an unimportant inscription may be shown to actually be an association copy. An association copy is inscribed by the author to another author, a well-known person, or someone else associated with the author. Alternatively, it may be signed by someone associated with the author. The term association copy can also be used to designate a book, not necessarily signed, which was owned by someone of note or by someone associated with the author. An example would be Allen Ginsberg’s copy of “On the Road,” a copy owned by the author’s mother or editor, or by someone famous. The closer the association, the better. Association copies can be very desirable; an association will enhance the book’s value. The dedication copy is one which the author has signed to the person to whom the book is dedicated. A dedication copy is the ultimate association copy / inscribed copy, due to its rarity. 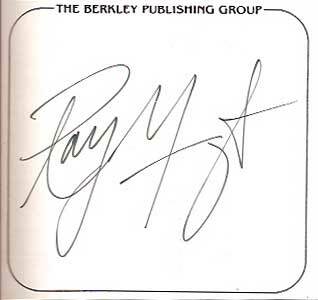 Bookplates are sometimes signed by the author, then affixed to books by the publisher. However, signatures signed directly on the book are more highly desired by collectors than those which appear on bookplates. See our article Bookplates: Various Types & How they Effect Book Values for more details. Facsimile signatures are those that are printed or stamped into the book. The author has not actually signed the book. It’s just a reproduction of the author’s signature. They are often mistaken for real signatures by novice collectors — and by experienced ones, too. It’s an easy mistake to make. Facsimile signatures can appear anywhere on the book but are most often found in one of a few places. A photo of the author, captioned with his facsimile signature, sometimes appears opposite the title page, especially in very old books. A facsimile signature is also sometimes found impressed as a decoration on the book’s cover. You may also find one at the end of the author’s foreword or introduction. To determine if a signature is real, or merely a facsimile, study it carefully with a magnifying glass or jeweler’s loupe. Genuine signatures will show some variations in the color & thickness of the ink. If you gently run your finger across it, you may be able to feel the ink as it is raised slightly above the surface of the paper, or as the tip of the pen has impressed the paper somewhat. Most often a facsimile signature will feel flat as it is printed onto the page just as the rest of the text and photos. It will appear uniform. Under magnification, it will most often appear to be composed of tiny dots, part of the printing process. If you have doubt, either find another copy of the same book, and compare, or take the book to a bookseller who specializes in used books or first editions. People commonly sign / date their own books, as a way of recording when they acquired or read them, or of indicating ownership. Such a signature may (or may not) detract somewhat from the book’s value; in any case, value is not added. Most of the time, though, a non-authorial signature in a book is simply a mark of ownership, as described above. A gift inscription simply means that someone, but not the author, has written something on the book before giving it to someone else as a gift. Gift inscriptions detract from a collectible book’s value. If giving a valuable book (or one that may become valuable) as a gift, it’s a better idea to just give a card (or maybe tuck in a note on acid-free paper) than to write on the book. Read more about gift inscriptions here. How Much Does an Author’s Signature Increase the Value? There’s no rule. If a book is signed by the author, it may be worth more than an unsigned copy. The difference could be large, moderate, or negligible, depending upon the book in question. Again, supply & demand comes into play. If the author is very popular, but signatures are scarce, the signature will be in demand. Factors to consider are whether the author is living or dead (and thus not signing any more books! ), if the author signed many books or few, and of course the desirability & collectibility of the book in question. Books signed by heavily-collected authors are much-desired. For example, every one of the thousands of collectors of Beat Generation literature would love to have a signed book by Jack Kerouac -one of the most influential & highly regarded writers of the 20th century – in their collection. Consequently, such books are in high demand and hard to find (Kerouac wasn’t a very prolific signer of his books anyway), and they fetch grand prices. For modern novels with authors still living, a signature will add somewhat to the price – perhaps ten to twenty-five percent. If the signature is very scarce, it may be worth more. The amount will vary depending upon the particular book & author and how easy that signed book is to find. However, the cookbook your Aunt Jane wrote, self-published, and signed is worth little, if anything, more than an unsigned copy. That’s because Aunt Jane’s signature, and her cookbook, are likely not objects of desire for book collectors. For more on book values, see our article On the Value of Books. The adjective holograph refers to something that is written entirely in the author’s handwriting. The term autograph is similar, but used only to denote handwritten letters. A.L.S. abbreviates “autographed letter signed,” referring to a letter written in the author’s hand, then signed. Similarly, T.L.S. is an abbreviation for “typed letter signed,” which means a letter which was typewritten, then signed by the author.